This healthy and colorful soup is quick to make on a cool night and combines nutritious ingredients and lively flavors. It is so delicious and just thinking about a bowl of hot soup will get you hungry. You are free to experiment and give it a boost with different flavors, condiments, and seasonal vegetables. 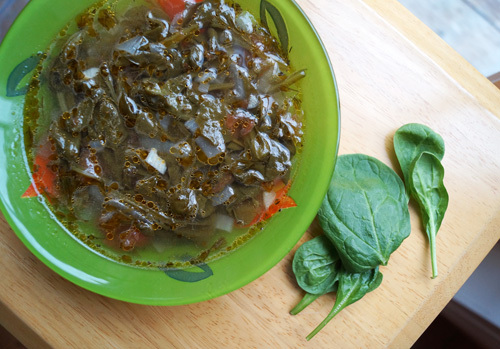 Spinach soup is hearty, easy to prepare on a busy day, and a comfort on a chilly spring night. Fresh parsley adds more flavor to this rich soup loaded with vegetables. It also works well when you have to feed a crowd. Heat olive oil in a Dutch oven or saucepan and saute onion until golden (2 - 3 minutes). Rinse all vegetables, peel and chop carrots, and chop spinach. Add spinach to the sauce pan. Cook for 4 - 5 minutes or until wilted and add water. Stir occasionally or a couple of times. Bring to boil, reduce heat, and simmer for 4 - 5 minutes. Season with salt to taste, cover with a lid, and simmer for 8 - 10 more minutes. Add parsley and tomato, cook for 3 - 4 minutes and leave aside to cool slightly. Divide into serving bowls and serve soup. You can garnish with fresh parsley or scoop cream on top. Cream makes for a tasty addition and an eye-pleasing contrast on your lunch or dinner table.